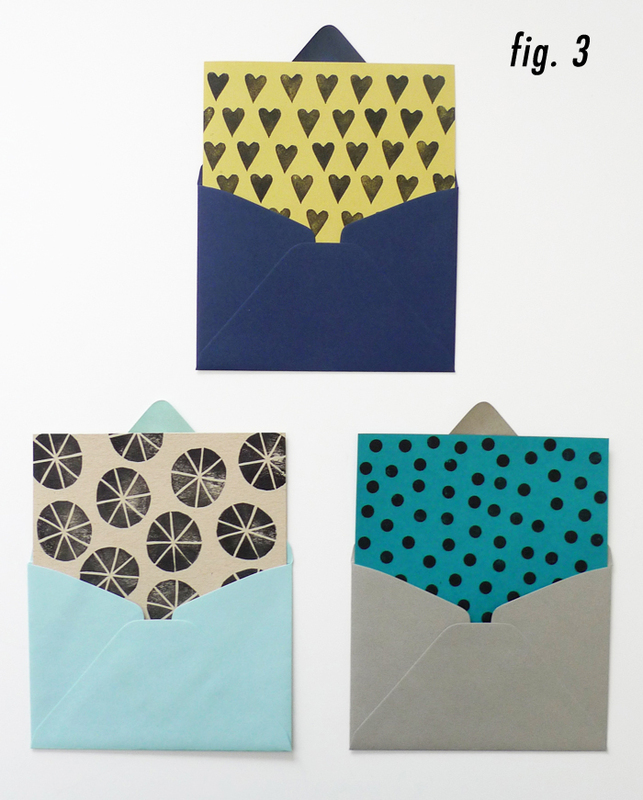 Did you happen to see Heather Ross’ DIY Envelope Liner project on the Etsy blog recently? I was totally inspired to try something similar, but instead of using a premade pattern, I wanted to create my own! 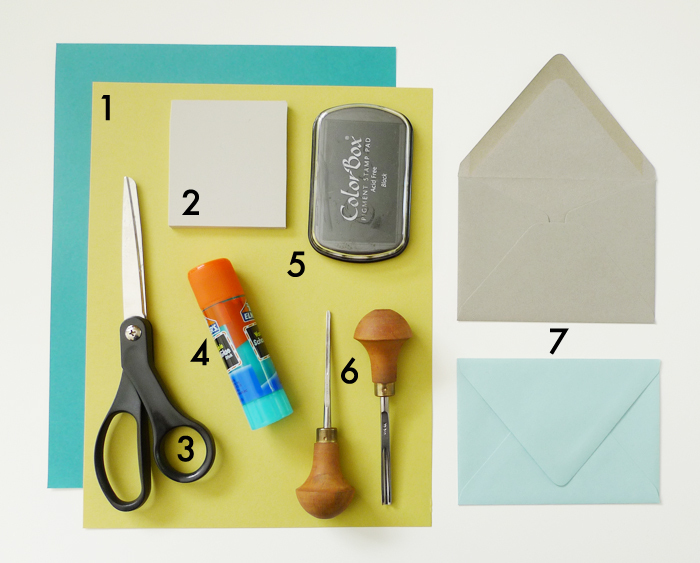 I’ll walk you through the steps of using hand carved linoleum stamps to print your own envelope liner, which is sure to impress any pen pal, and could even be used to create personalized stationery or wedding invites! Begin by trimming the blank paper to size. First, unfold the top envelope flap, and measure from the center of the bottom of the envelope to just under the glue on the top of the flap. 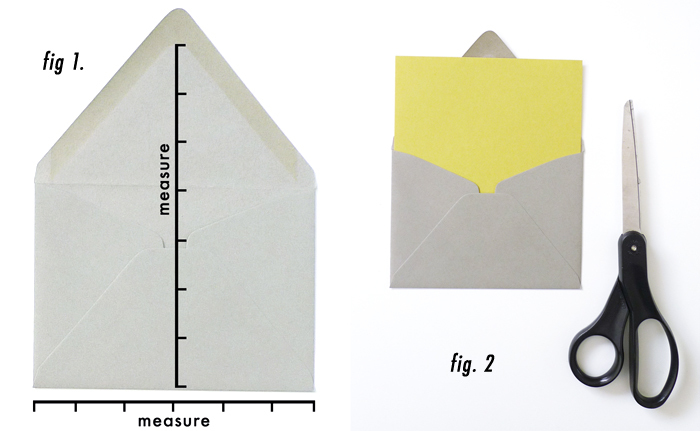 Then measure the width of the envelope (see Fig. 1). Trim your paper to accommodate this size. 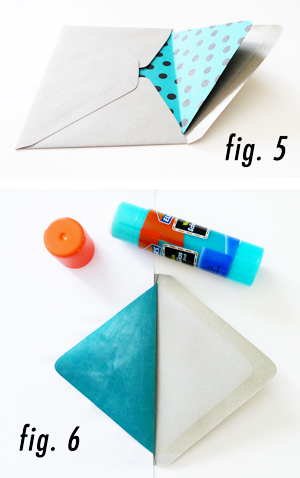 Slip the piece of paper into the envelope to test if it will fit (it should look like Fig. 2). Play around with size and scale, see if you prefer the look of a larger design, or a very small design. 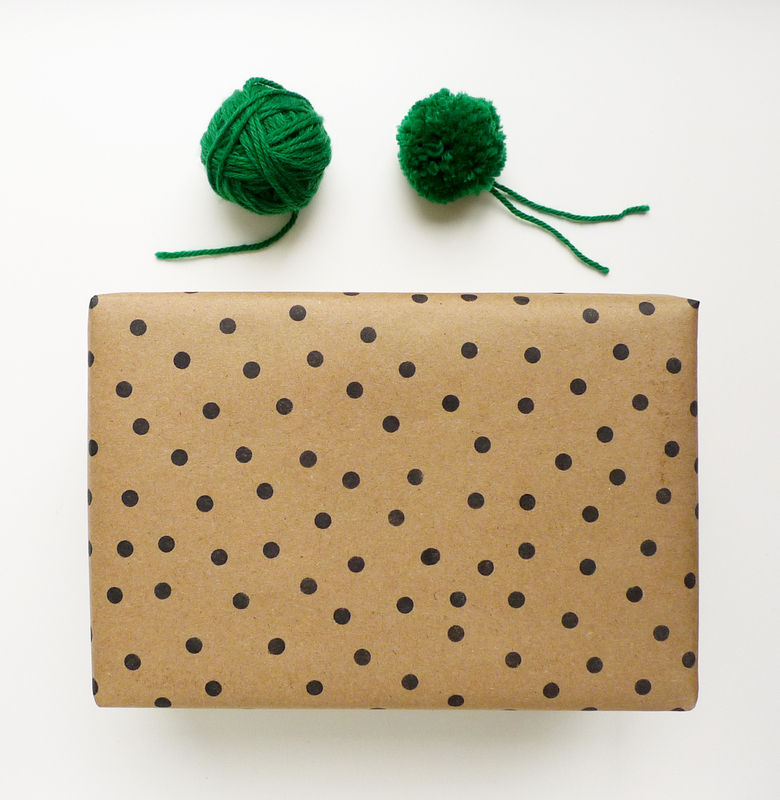 You’d be surprised how much a simple polka dot can jazz up a plain envelope. 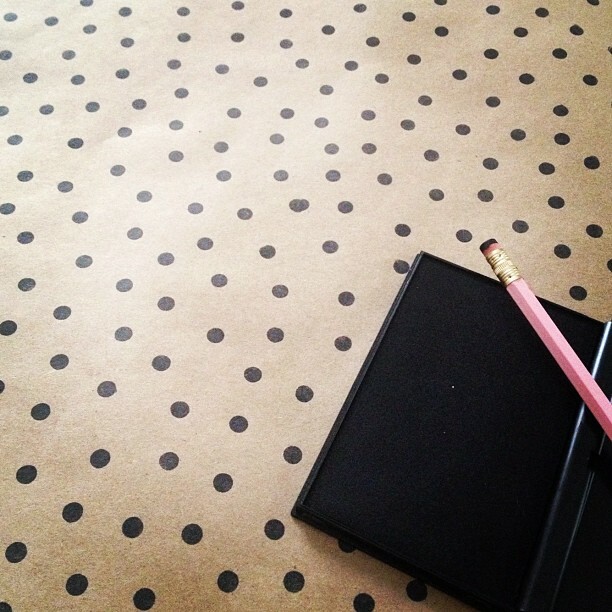 Stamp your design onto the liner paper using the ink pad, either in a uniform pattern, or completely randomly! I like to mix it up and try a few different variations. You can even combine two or more stamps into one design. Allow the ink on the liner to dry before continuing. 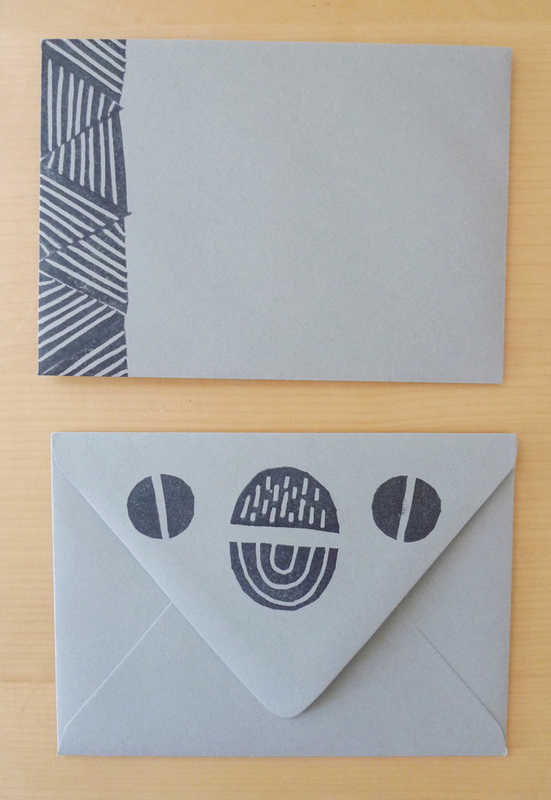 Slip the freshly printed liner paper into an envelope, with the printed side facing out (see fig. 3). Fold down the top corners of the liner on both sides so that the folded edges run just below the glue line on the envelope. 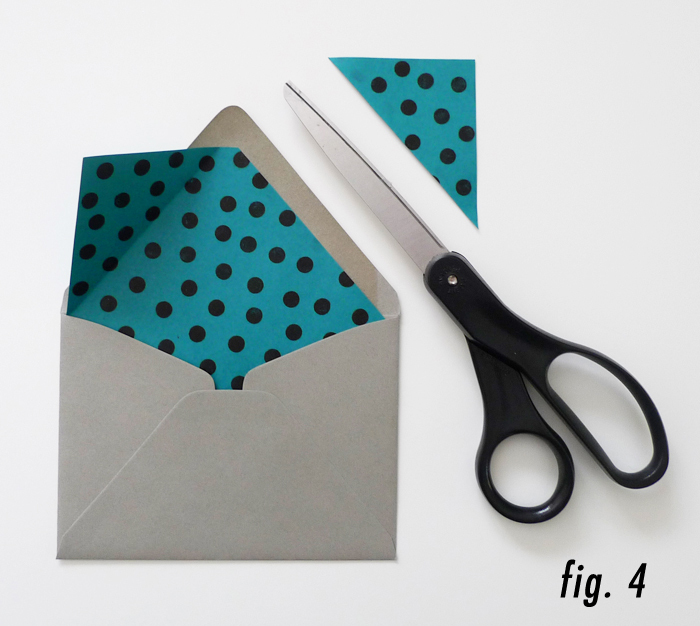 Remove the liner from the envelope, and cut off the corners along the creases (see fig. 4). 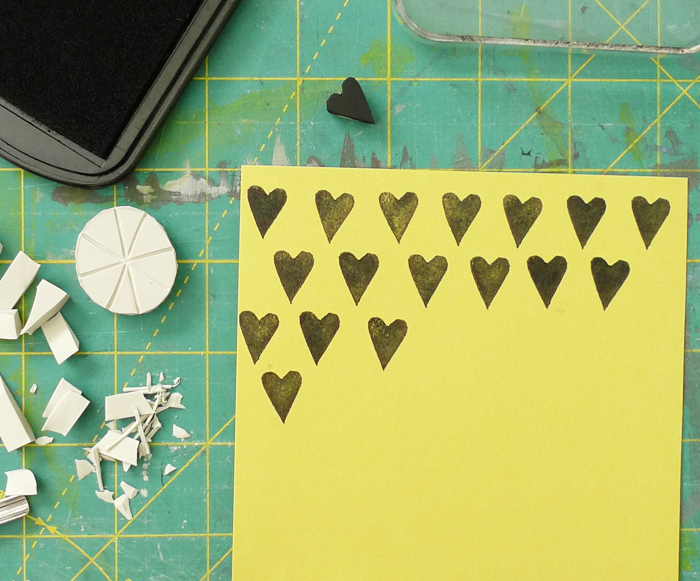 You can also cut a rounded corner at the tip, to make it look even more professional. Insert the liner back into the envelope, and fold down the envelope flap. This will crease the liner at the fold (see fig.5). Lift up just the envelope flap, leaving the liner in place. Slide a piece of scrap paper under the liner to protect the outside of the envelope from glue (see fig. 6), and use a glue stick to apply glue to the edge of the liner (note that it is only necessary to glue the liner’s flap). Close the envelope flap over the liner and press firmly to adhere the liner to the flap. Remove the scrap paper. Feeling inspired? 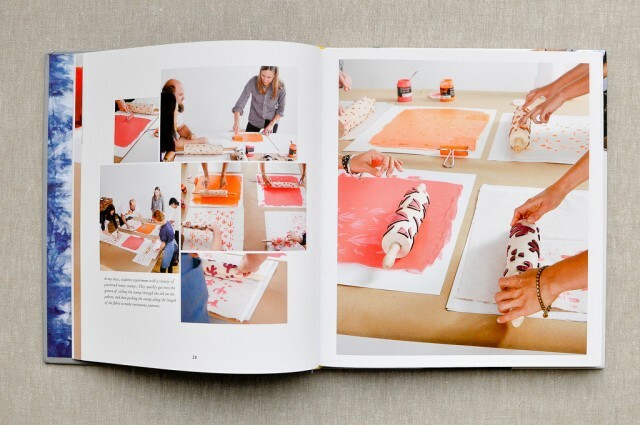 Check out my other block printing DIY projects! Ready to dive in to the world of printmaking? 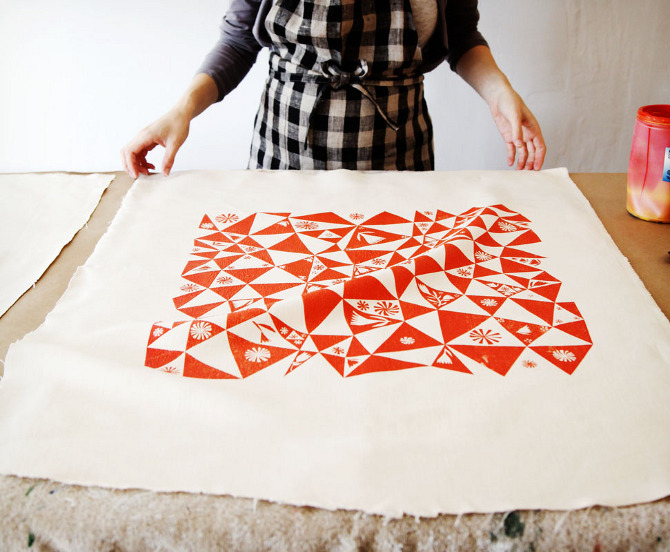 Check out my screenprinting class on Creativelive! Have you heard of the Purl Bee? 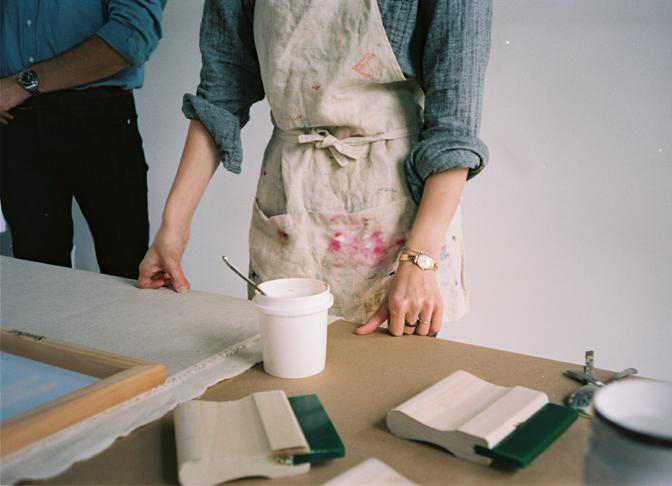 It’s a craft blog created by Purl Soho, an awesome fabric and yarn shop in NYC. 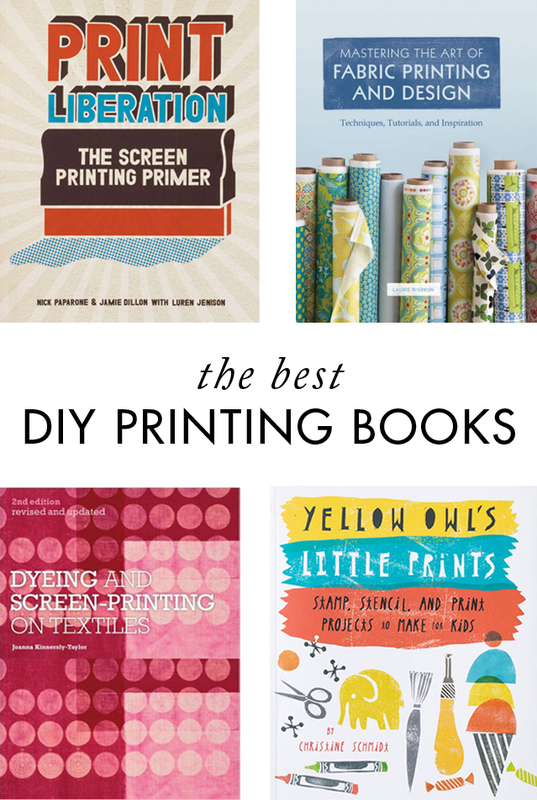 They publish tons of DIY projects and ideas for you to knit, crochet, sew, stitch and more. I don’t knit or crochet anymore, so I go straight for the sewing projects, and the tutorials I’ve tried have been fantastic! 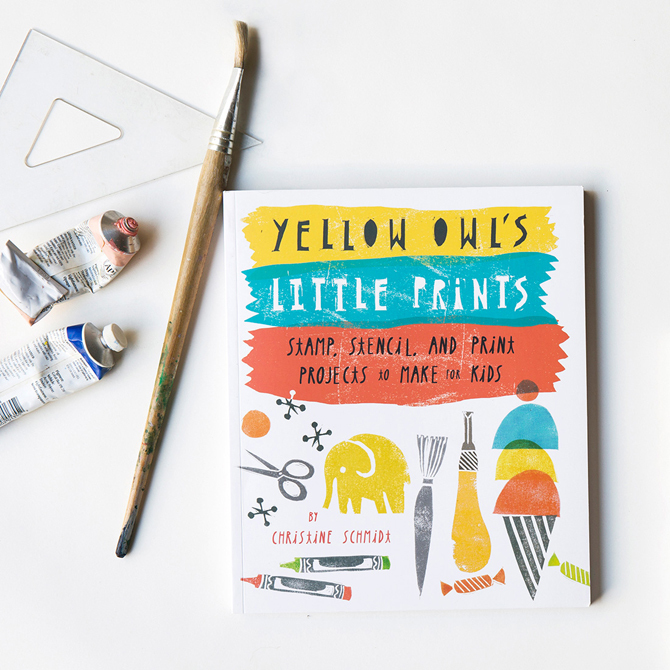 They do a great job showing you the details of each step, and they even show you where you can buy the supplies for most projects. After finding some old sheets of Letraset letters at a garage sale a few weeks ago, I was looking for a creative way to use them up. 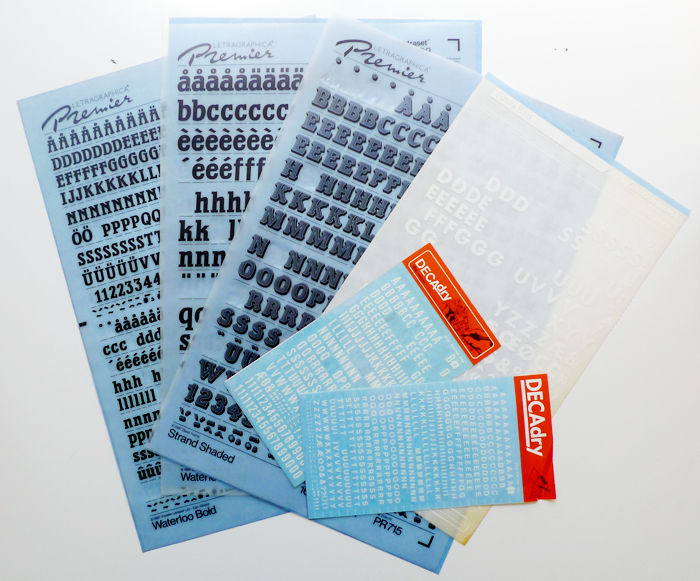 I wasn’t very familiar with Letraset, but knew they were a relic of the graphic design world from before computers were ubiquitous, which made them seem just outdated enough to be fun. I’ve got nothing against computers, but I have an affinity for archaic technology in all it’s forms. I decided it would be appropriate to try out the letters on some envelopes to see what it would look like. 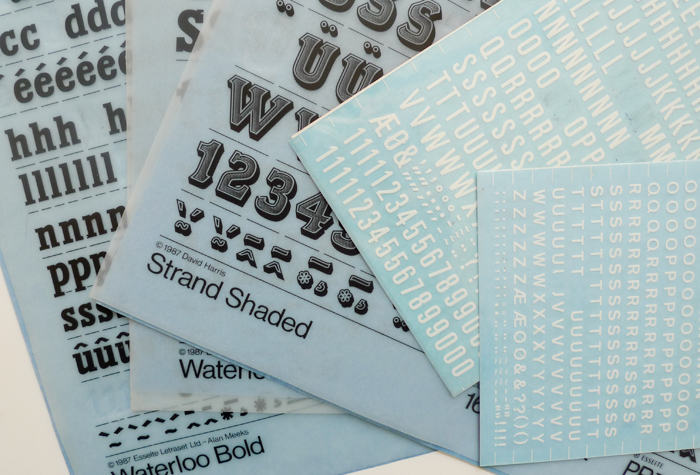 In case you’ve never encountered them before, Letraset are sheets of dry transferrable lettering, which can be transferred one by one onto a piece of artwork by rubbing directly on the transfer sheet over the letter you wish to transfer. It’s a tedious process, but before computers were available, the alternative was to draw out letters by hand. It seems that Letraset was available in many different colors, although I only found black and white. 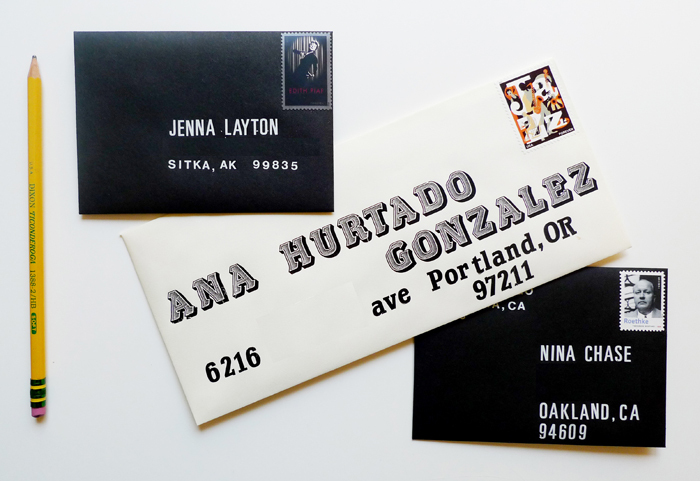 It was easy enough to transfer over my friend’s addresses to the front of different colored envelopes, although I did start to get a cramp in my thumb from pressing down on the transfer sheets over and over again. I’m not sure that I would recommend this method for everyday snail mail, since the letters seem like they could potentially flake off a little during transit, and the black letters could easily be replicated using a computer. In fact, with most household printers being able to accommodate different sizes of envelopes, I’d say you’d probably be better off just laying out something cool in Word or Photoshop, and then printing out your designs that way. The only exception to this? The white letters! The white letters are so unique, since you can’t print something like this out from your standard ink jet printer. 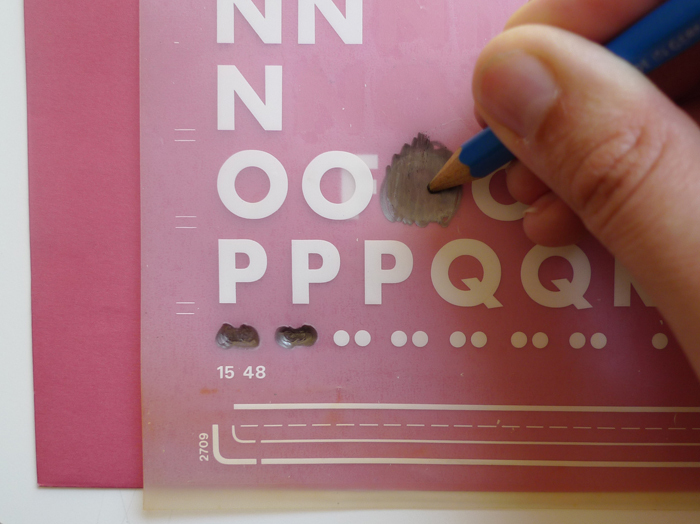 You’d be hard pressed to even get these types of results with a stamp and white opaque ink. 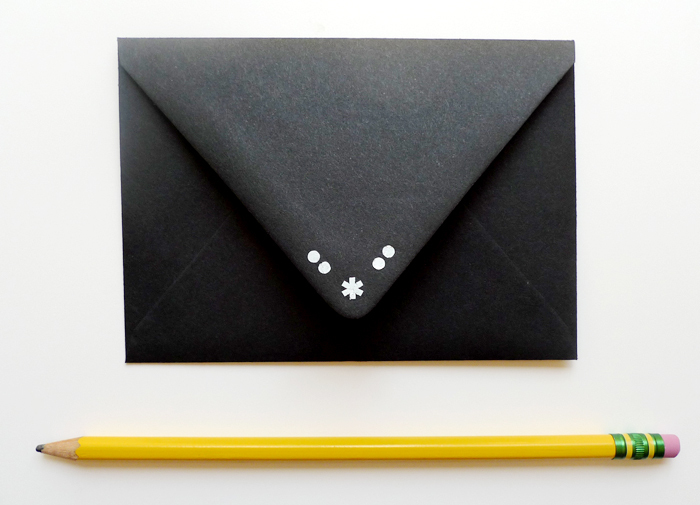 The white Letraset looks super bold on the black envelopes, and I’ll be using it often to label my darker envelopes. 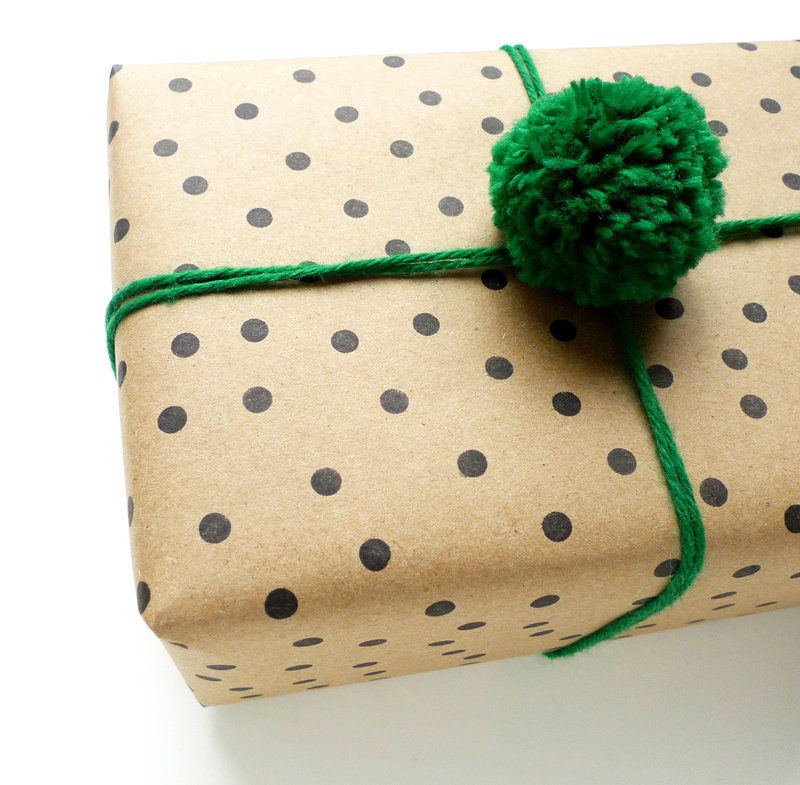 Remember those stamps I made for the Hand Stamped Gift Wrap DIY? 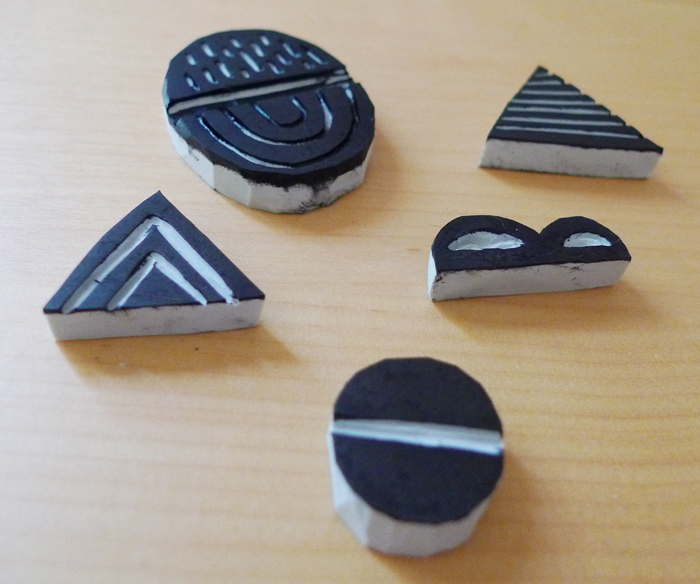 Well, I just got them out again to stamp some patterns on some snail mail that I’ll be sending out this week. 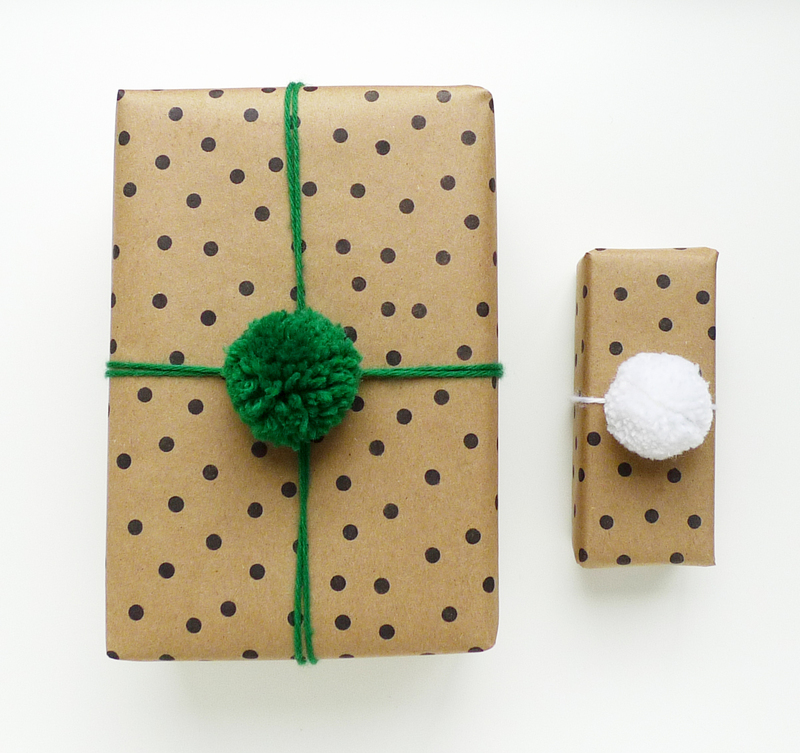 I even used a little of the leftover gift wrap to write the letter! 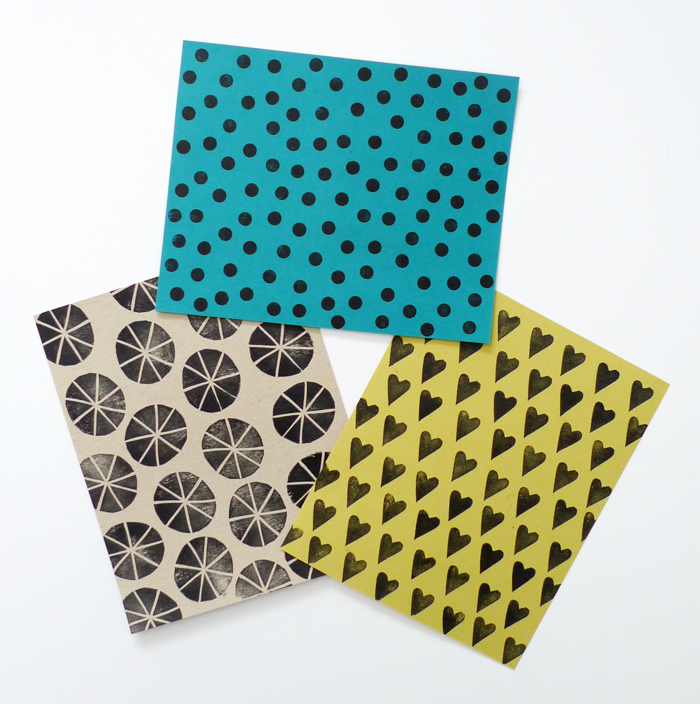 I printed the envelopes using a standard stamp pad, grouping the stamps in new ways to create variation. 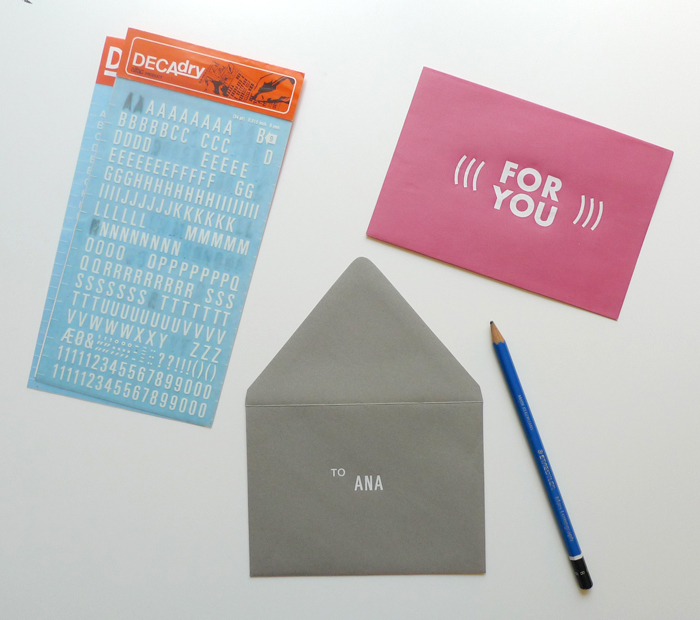 Just make sure to let the ink dry before handling the envelopes (to avoid inky fingerprints). 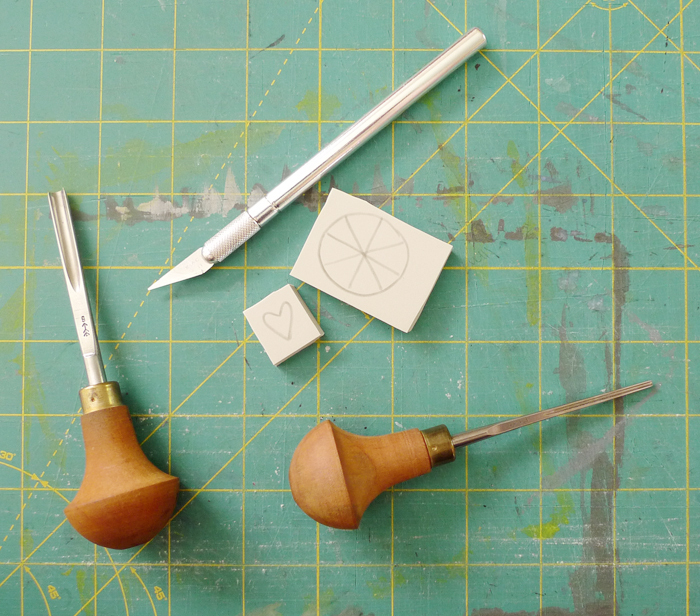 If you take good care of your linoleum stamps, they can last for years. Just keep them out of the sun and away from dry, dusty areas, and they should keep their shape quite nicely. 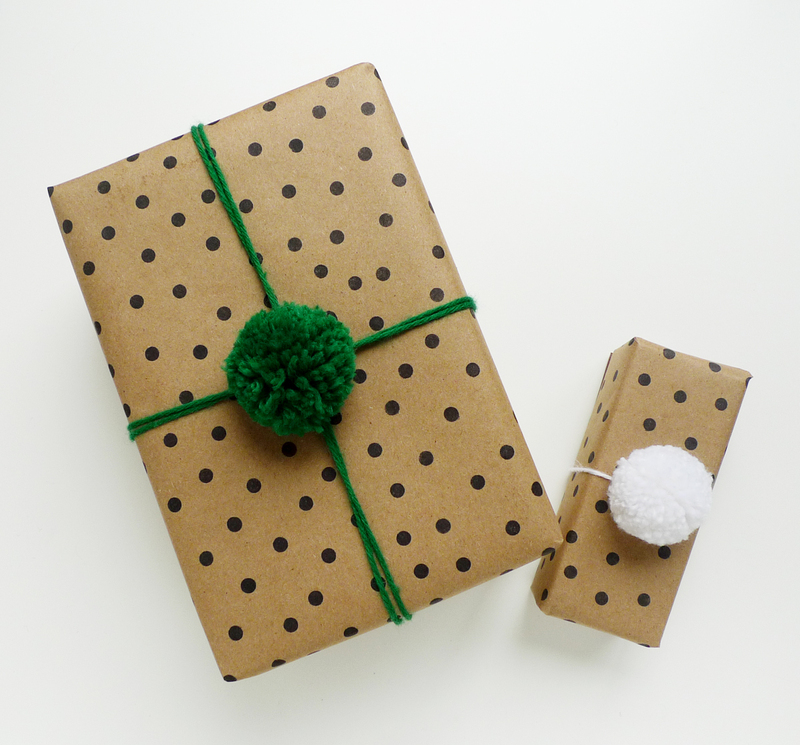 You can reuse them over and over for all sorts of projects, on both paper and fabric. 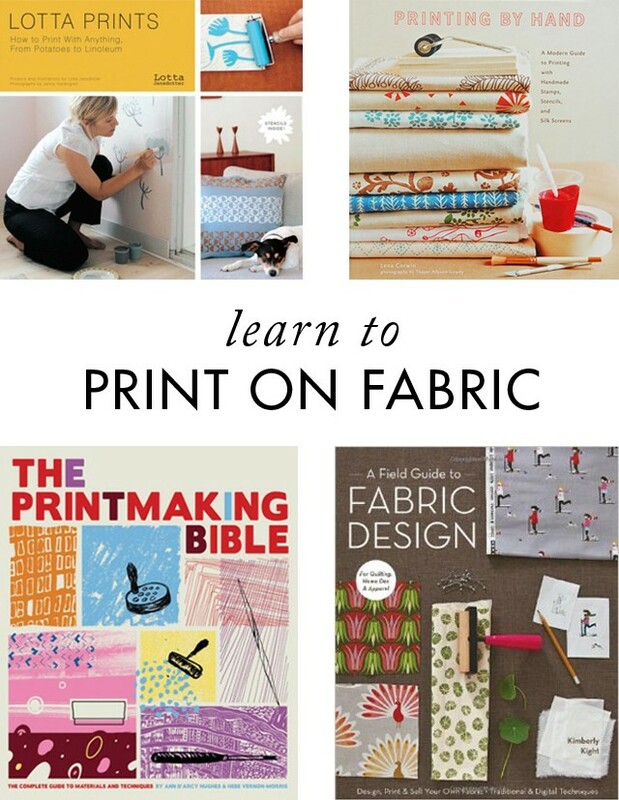 That’s right, you can stamp on fabric, too! I’ll be posting a DIY on that topic soon, so stay tuned.